Paper Hearts 4×8: Tell me about this dream. "Tut, tut, child! Everything's got a moral, if only you can find it." Writer Vince Gilligan first popped up on The X-Files’ roster with Season 2’s “Soft Light” (2×23) before breaking out with the hallmark episode “Pusher” (3×17) in Season 3. It turns out that Gilligan began as a screenwriter and was a fan of The X-Files as a regular ole’ viewer long before he came on staff. This explains both his predilection for cinematic stories and why this episode is almost unnervingly cannon in content. 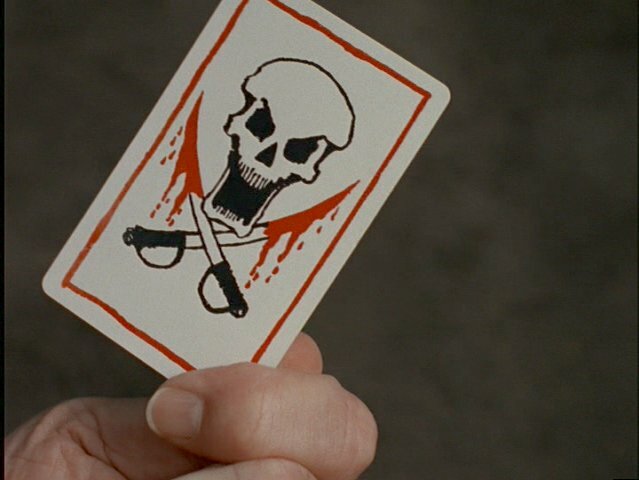 For a man who claimed that mythology episodes weren’t his strong suit, Gilligan is awfully accurate about the myriad of X-Files facts that he scatters throughout “Paper Hearts”, an episode that uses the mythology as its base even though it’s certainly not a mythology episode and can barely be categorized as a Monster of the Week. It’s more a psychological study than anything else, along the lines of “Irresistible” (2×13) and “Grotesque” (3×14). But I digress. 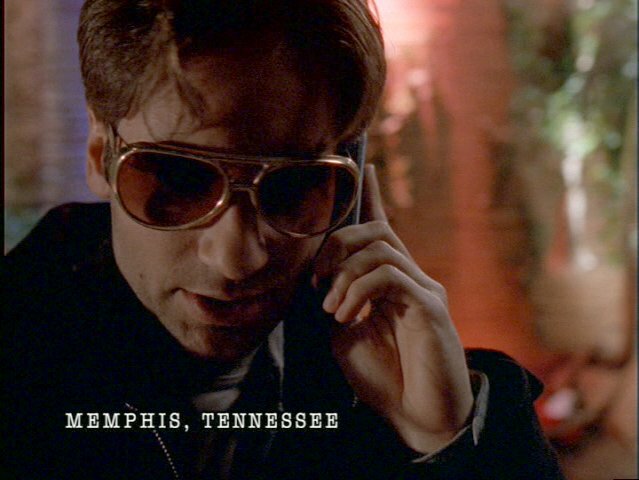 Every fact except Mulder’s birthday makes its way in here through such fleeting references as a mention of Mulder’s former mentor Reggie Perdue who was killed in “Young at Heart” (1×15) and a quote from the episode “Aubrey” (2×12). That’s not even counting the word-for-word recreation of Samantha’s abduction with adult Mulder inserted into the mix, a scene that’s perfectly done. Clearly, “Paper Hearts” is written by a man who understands the language of fandom. And like the fans, Vince Gilligan is well aware that the whole premise of The X-Files hinges on Mulder’s belief that his sister Samantha was abducted by aliens. If indeed she turned out not to be, the payoff wouldn’t be as grand. And indeed, eventually it wasn’t. That’s why this episode isn’t pretending to be a legitimate explanation for what happened to Samantha but an exploration of the possibilities. What Gilligan is tapping into is that seed of doubt. Mulder himself stated back in “Little Green Men” (2×1) that he wasn’t sure if his memories of Samantha’s abduction were real, and since then he’s run into a couple of different versions of “Samantha”, or at least her clone. What is Mulder to believe? Is she still out there somewhere? Is this whole alien conspiracy a ruse as Scully claims in “Paper Clip” (3×2) so that the men behind a set of secret and sadistic experiments can hide their crimes? It’s an issue that will come up again for Mulder later in the season and will be explored at length in Season 5. But I digress. Part of the reason I used to not enjoy this episode was because I could so easily dismiss the idea of a serial killer being responsible for what happened to Samantha. The main reason is that I always go into Monster of the Week Withdrawal around this point in the series. We haven’t had a really satisfying one since “Unruhe” (4×2) and “Paper Hearts”, while technically a Monster of the Week episode, is more of a character driven episode than a scary or paranormal one. That said, it’s satisfying in its real world horror in the same way that “Irresistible” is. And it’s far more satisfying than the one note insanity of “Grotesque”. In the same vein of both of those episodes, there’s very little of the supernatural to speak of, if indeed anything of it exists at all. And that’s just fine because the implication of what Roche is doing to these little girls is worse than the vague fetishism of Pfaster in “Irresistible”. Roche is more than just your run-of-the-mill sociopath; he’s a match for Mulder intellectually. It’s another game of which genius can outplay the other. One almost thinks Mulder and Roche could have been friends… if Roche wasn’t a sadistic pervert. At the very least they get each other. Admittedly, the “nexus” idea is a little weak as a plot device. But I suppose Gilligan had to give some sort of a name to their unusual connection. And, after all, this is The X-Files. Something has to remain unexplained. This season is low on scares but high on character development. It makes sense because the show is a major hit at this point in its run; this means that the writers are trying to keep themselves out of a rut, the audience is calling for more information on their favorite characters and the actors are looking for a way to show off their skills. It only makes sense to give Mulder and Scully more time to shine than they have on their average case. Gillian Anderson and David Duchovny were more than up to the task. And that Tom Noonan as Roche… whew! He’s so cavalier that he almost transcends being creepy. And I just love the way that Gilligan has written these characters. I particularly love Scully in his episodes as she’s almost always a woman to be reckoned with. Here her barely restrained anger is palpable and even Roche seems a little afraid of her. Her eyes were saying something along the lines of “I will drop you.” Not only that, when it comes to her partner she knows when to hold ’em and knows when to fold ’em. She chastises him when necessary and ignores his mistakes when the situation calls for it. The strength of her compassion for Mulder in this episode is memorable and considering what episode is coming up in just a few days, it’s an emotional buoy of sorts. Now Mulder, well, what’s most interesting is that Mulder is coming to the more rational conclusion that his sister was simply kidnapped, not abducted by aliens. Yet he’s coming to a rational conclusion in the most irrational way so that at least we know he hasn’t changed… at all. David Duchovny really should have gotten an Emmy for his performance in this one. Scully: You’re right, Mulder. It’s not a match. It’s not her. Oh, what a powerful scene. In a season that’s going to give me lots of reasons to hate Mulder, thank you, David Duchovny for reminding me that I love the heck out of this character. In closing, I’d just like to note that this episode is another strike against the “Mulder as Jackass” stereotype that’s hijacked his legacy over time. Mulder closes a potential door to the answers he’s seeking in order to save a little girl, just as he’s closed doors and will continue to close more doors for Scully’s sake. Mulder is a deeply flawed human being, but he’s an incredibly humane one as well. The nexus theory still doesn’t explain how Roche knew what model vacuum cleaner The Mulders had in their house. In another point of continuity, remember the scene in “Conduit” (1×3) where Scully tries to stop Mulder from digging up the potential grave of Ruby Morris, another little girl lost. Even their positions are the same. The difference in this case is that rather than hinder him, or even just watch him break the rules, Scully puts Mulder’s emotions above procedure and digs right alongside him. I heart these two. Yep. It’s true. David Duchovny sunk that shot on the first take. I almost committed a travesty of justice by failing to mention The Magical Mystery Tour of Whimsy that Mark Snow’s score takes us on this episode. Consider it mentioned. Scully: You said it yourself once. You said that a, a dream is an answer to a question we haven’t learned how to ask. Scully: Don’t you think the car might have been searched at least once already? Mulder: Sixteen victims, John. How come you said there were only thirteen? John Roche: I don’t know. Yeah, thirteen sounds more magical, you know? John Roche: How about this? Sink one from there and I’ll tell you. John Roche: Trust a child molester? Roche: This man, this man hit me! Guard: I didn’t see it. Roche: It was Karen Ann Philiponte. She lived in a green rancher in… East Amherst, New York. Minter grew outside her window. I stood outside her window atop springs of mint. It smelled wonderful. Scully: [Through gritted teeth] What year? Hell Money 3×19: I’m more haunted by the size of my mortgage payment. I mentioned in the last episode the fact that The X-Files had nary a success with stories that relied on an ethnic/cultural myth. There will be others that fail similarly, “Teliko” (4×4) and “Alpha” (6×16) come to mind, but none is a better example than “Hell Money”. The reason is that “Hell Money” takes what would actually be a frightening premise for your typical police procedural and attempts to turn in into an X-File by clouding it in Chinese ghost stories only to present the whole thing to an audience who isn’t actually frightened by Chinese ghost stories. There’s a cultural disconnect when it comes to the cursed remains of ancestors in “Teso Dos Bichos” (3×18) and fake money paid to ward off spirits here in “Hell Money”. Most often, someone who isn’t raised on these myths and legends has a hard time taking them seriously. So not only does the episode first have to educate and explain the significance of the myth, something that already takes away from it’s ability to frighten, but then it has to convince us why we should be scared. That’s a rather discouraging combination. That’s all too bad because it takes away from an episode that could have worked wonderfully, just probably on a different show. This is one of the few X-Files episodes where absolutely nothing paranormal happens outside of a few anesthesia induced hallucinations. Like “Grotesque” (3×14) earlier in the season, the story is about human evil, except that in “Grotesque” evil possesses a man almost against his will while in “Hell Money” evil takes the form of men consciously preying on the desperate. I don’t have to tell you which picture of evil is more disturbing. Which is why on a lot of levels this episode does work. Despite the overabundance of exposition there are moments that are frightening, just not in the paranormal sense. Certainly this idea of a lottery where kidneys and eyeballs are at stake is fabulous. (I can’t quite believe I just typed up that sentence.) And the corruption of authority, in this case, police corruption, is never too old a tale. Not to mention if the cruelty and callousness of the game doesn’t grab you there’s the whole burning men alive in the incinerator bit. This episode feels like a script from Law & Order was cut and pasted into an X-File with random lines about ghosts thrown in. 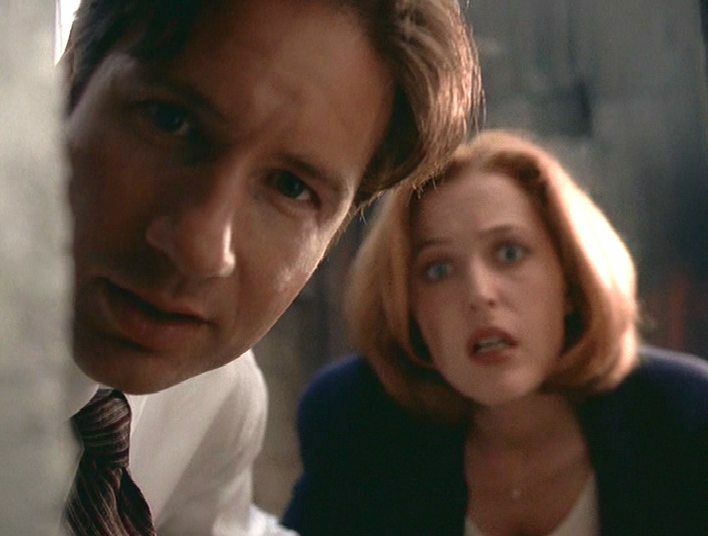 With the possible exception of a frog crawling out of a corpse, there’s no moment where I say to myself, “This must be an X-File.” Why were Mulder and Scully called in to begin with? There was nothing supernatural/abnormal about the initial murders other than that they were gruesome serial killings so I don’t see why they would have peaked even Mulder’s interest. The ghost symbol wasn’t even known about till Mulder and Scully arrived on the scene. It’s a good story and a scary story, it just suffers from being presented on the wrong platform and with an unnecessary excess of cultural baggage. I can’t say I don’t enjoy it more than a few other episodes this season. 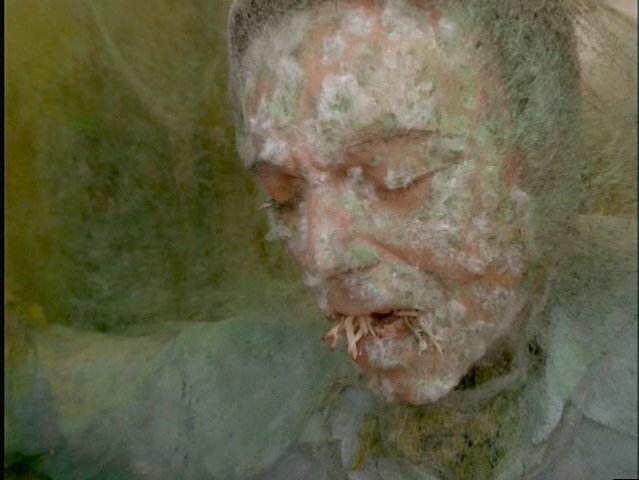 I also have to give this episode credit for having one of the most horrific endings ever on The X-Files. It’s truly terrifying, more than enough to bump it up a grade. 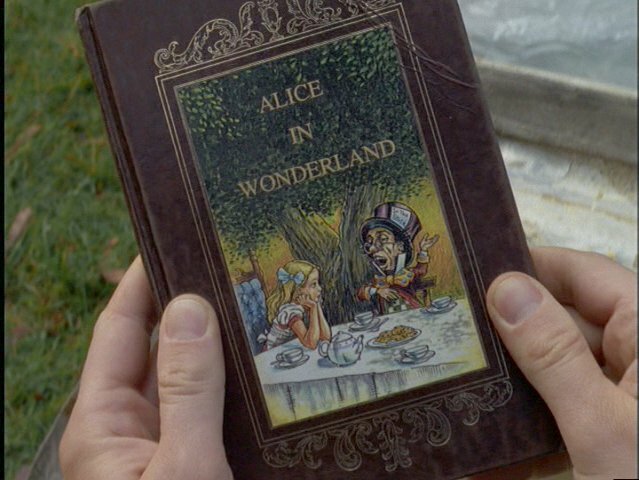 This was writer Jeffrey Vlaming’s second and last episode on the show. His first was “2Shy” (3×6). Hsin’s motivations never completely make sense to me. Just from the nature of the game, it’s only a matter of time until you lose something more valuable than a spare kidney. Risk of death aside, if he loses both eyes, for instance, he could end up spending as much on his own care and rehabilitation as he needs for his daughter’s surgery. The same goes for everyone else in the game. But I don’t suppose we’re meant to ruin this whole schtick by imposing logic on it. You can win a lot more than 2 million dollars in the Powerball and you don’t have to risk life and limb. I’m just sayin’. I can’t let this episode pass without mentioning the appearances of a young Lucy Liu and a young B.D. Wong. Consider them mentioned. Does Mulder purposefully skip days between shaves? Detective Chao bled out all over the place when the “ghosts” kill Johnny Lo in the teaser, that’s why they had to replace the carpet. So why is it that he failed to replace the carpet padding? If you’re going to do it, do it right. Scully: His name was Johnny Lo. He moved here about six months ago from Canton, still in the INS application process. He was a dishwasher in Chinatown. Scully: So now we’re chasing ghosts? 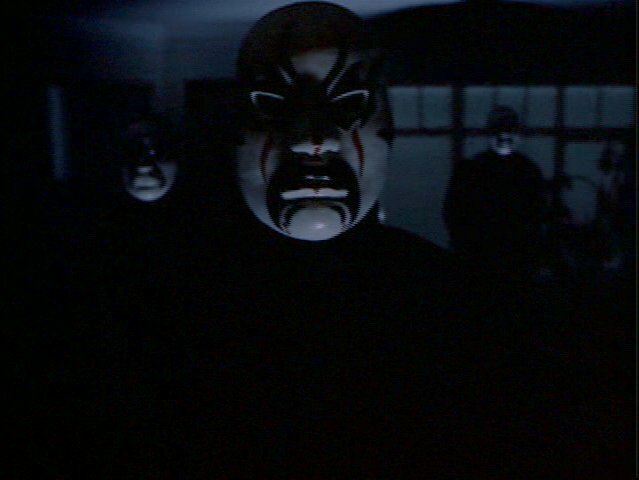 Mulder: “Who you gonna call?” Ghosts or ancestral spirits have been central to Chinese spiritual life for centuries. Scully: So you’re saying the ancestral spirits pushed Johnny Lo into the oven and turned on the gas? Mulder: Well, it sure would teach him to respect his elders wouldn’t it?